Heavy-duty polished clear vinyl sleeve. *** Extra pocket to decorate one side and use the other side for storage! *** Use as a debit card, credit card, membership card, ATM card or Insurance card holder. It is also perfect for business cards, fishing licenses and hunting licenses. Made from heavy 12-gauge clear material on the front with a 12-gauge clear pocket on the front and the back. Overall dimensions: 2 1/2" x 4"
Maximum suggested insert size: 2 1/4'' x 3 1/2"
Store, display or protect your documents or other items. Decorate with your favorite picture, embroidery or craft. There are endless uses for clear vinyl pouches. Other sizes available. 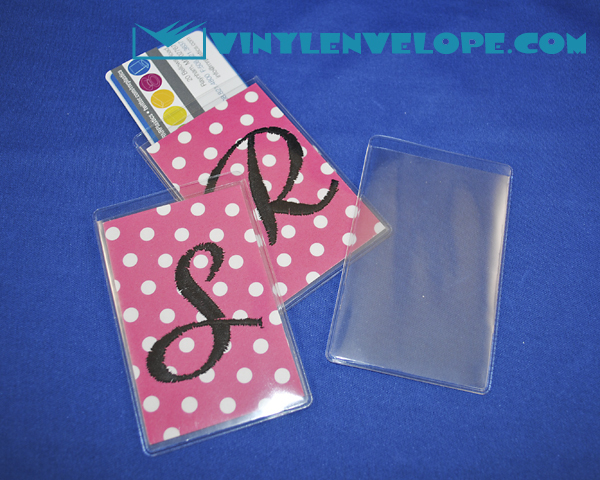 Contact us for information about larger quantities, for colored pouches or to get custom printing.